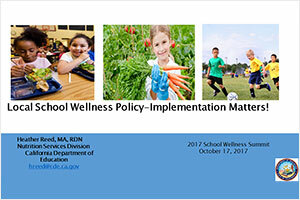 Local School Wellness Policy-Implementation Matters! The vision for Local School Wellness Policy (LSWP) is to foster a healthy school environment where students thrive and are ready to learn. A policy is only the first step; school districts must implement their LSWP. But how, given the competing priorities for schools? Providing an overview of the LSWP requirements, the role of public involvement, and key steps and resources to implement LSWP by Heather Reed, California Department of Education. 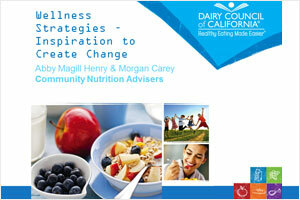 Evidence-based curriculum resources for Nutrition Education, Physical Activity and other school-based activities that promote student wellness; California LSWP Collaborative resources and network of best practices by Morgan Carey and Abby Magill Henry, Dairy Council of California and CA Local School Wellness Policy Collaborative. 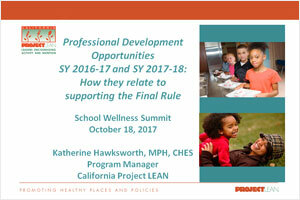 Professional Development Opportunities SY 2016-17 and SY 2017-18 and how they relate to supporting the Final Rule by Katherine Hawksworth. ProjectLEAN, Parents in Action Train-the-Trainer: Advocating for Healthier School Environments, Coordinated Approach to Child Health (CATCH), Local School Wellness Policy 201, Strategic Health and Wellness Planning Sessions, Nutrition and Students’ Academic Performance, Energizers for the School Day to Support Student Achievement, Nutrition Education Curriculum Resources. 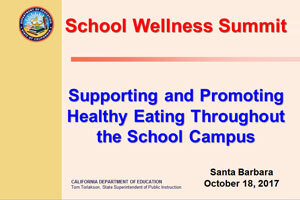 Thriving Schools: School Employee Wellness Champions. 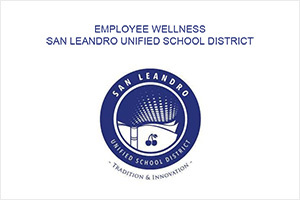 The wellness effort in San Leandro Unified School District serves as an inspiring model for united labor and management partnership in a shared goal, serving as a first step toward long-term culture change to promote employee wellness by Isabelle Wettergren, San Leandro USD and Tamar Schnepp, Kaiser Permanente. Addressing your district’s wellness policy: Foods and beverages sold and given away. Presenting an overview of the competitive food standards and resources including marketing, advertising, and fundraising. Meet the minimum or go above and beyond! 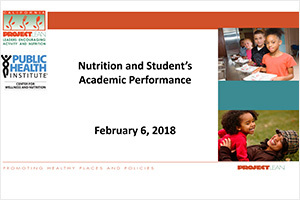 California Nutrition Standards, Competitive Food Rules, Quick Reference Cards, Marketing, Fundraising, School-sponsored events by Mike Danzik, California Department of Education.